Arches National Park in southeastern Utah is a geological art gallery, containing thousands of natural sandstone sculptures, including more than 2,000 arches carved over millions of years by erosion. But now the park is down by one: Wall Arch, one of the park’s most popular attractions, came tumbling down unexpectedly last week. On Tuesday, Aug. 5, a park ranger discovered the fallen arch, near the well-trodden Devils Garden Trail. On Aug. 7, geologists from the National Park Service (NPS) and the Utah Geological Survey came out to assess the damage. “They told us they had a collapse and wanted us to determine how unstable the area was,” says Tim Connors of the NPS Geologic Resources Division in Denver, Colo. Although park rangers hadn't observed signs of imminent collapse at Wall Arch, the arch's failure was "just part of the standard weathering process," says Steve Bowman, a geologist with the Utah Geological Survey in Salt Lake City. Now, however, stress fractures in parts of the remaining limbs of the arch, which probably developed after the main collapse, suggest that the arch isn’t quite finished falling, Connors says. Due to concerns over possible ongoing hazards, park officials closed the Devils Garden Trail on Aug. 5 and have not yet reopened the trail to visitors. ...and after its collapse in early August 2008. 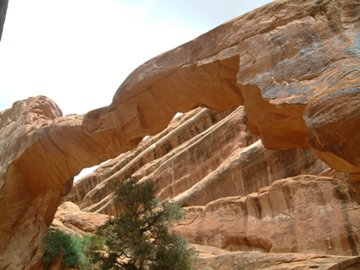 Wind and water erosion began to shape Utah's famous arches about 100 million years ago. Beneath Arches National Park is an underground salt bed, the remnant of a 300 million-year-old ancient sea that once covered the Colorado Plateau. Under the pressure of the thick overlying layers of more recently deposited rock, the salt layer began to slowly flow, buckle and deform, pushing the rock above it into domes. Faulting also cracked the landscape, leaving older layers of rock exposed while erosion ate away at the younger, topmost layers. The result of all this activity was a series of “fins” of rock that jutted out across the landscape; with more time, wind and water gradually eroded the less resistant parts of the rocks, forming the arches. Wall Arch was discovered in 1948. At 22 meters wide and 10 meters high, it was one of the largest arches in the park. 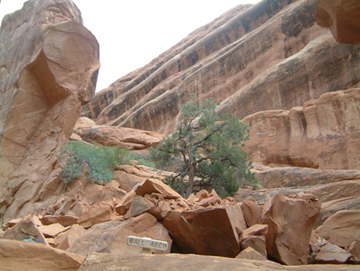 Prior to Wall Arch, the most recent arch failure in the park occurred in 1991, when a large slab of rock fell from the 93-meter-long Landscape Arch, making that already fragile formation even thinner.